Darlings, to your left take a gander at Sam Edelman’s feisty Orlando Suede Boots with Fur Cuff; to your right, savor the saucy style that is Charlotte Russe’s triple threat a la the 3-In-1 Furry Boot. 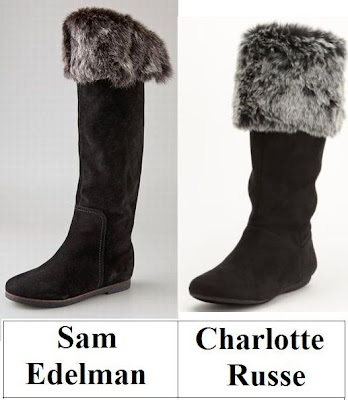 Though the chic Charlotte Russe offering is constructed out of faux suede, as opposed to the real suede aesthetic of the Sam Edelman; for just $40.00, in comparison to the $200.00 price tag of the Orlando, it allows the frugal fashionista to make a furry statement for fall in not one, not two, but three haute hues (black, brown, and tan) – without breaking the bank! Tell me, kittens…will you be a big spender and go for Sam Edelman, or be thrifty and spring for Charlotte Russe? This is the first time I really prefer the expensive version! I think the proportions on it are a little more interesting. Would definitely love them in my closet! I like Charlotte's better. Suede is not easy to keep, either. Just love the big furry top compare to the other one. Plus some of us don't have quite the long legs for the expensive version. I like that the Charlotte style has more of a fur collar, and with snow predicted here tonight, I'd go with those! I like the cheaper one. They look more comfy. I really like the length of the Sam Edelman boots. Both versions of the boots are nice, but I love knee highs. I like the height of the boots from CR better. So cozy and I love them! I like the Ronson ones better due to the height! I'm not big on fur to start with, but have to go with the Sam Edelmans. Such a good height and the CRs look a little cheap. I don't like the Sam Eldon ones. I love the other ones, though. Charlotte Russe for me this time! I seem to vary between the expensive version and the cheaper one, don't I? Anyway, the Charlotte one is more relaxed, slouchier, and overall looks better! i actually think the charlotte russe ones look better, without the visible seams and heels, so i'd definitely be thrifty! So cute! I need some boots like these in my winter wardrobe. Not really my style, but I do like the Charlotte Russe better. I have to go with the expensive one this time. These boots are perfect for winter,I'm already thinking of outfits to wear these shoes with. I'm gonna go for the Sam Edelman pair! I like the height of those better and the minimal fur is more appealing to me. They look like they'd be so cozy for the cool weather too! I have to go with the Edelman ones! both versions are good but the Sam Edelman one's are higher so I'd pick that pair. I'm going to have to go with the SE on this one. I adore Sam Edelman construction and I am aware with how easily CR's items seem to fall apart. Maybe with CR, I am just more careful with footware. I think for the price the Edelman's are quite a good buy. Erika I'm throwing up a red flag (or is that white?) I'm looking for a lace-up suede knee high boot in brown or dark grey suede...have you ever seen anything like this? i've seen some bootie versions. oh, and there was the time on saturday when the bf saw it while i was in the fitting room at j.crew and was too shy to ask the lady or cause a scene and tell me in case i came running out in my underwear. off course i choose Charlotte Russe's boots darling.. I need boots with fur! It's so cold in London, that my legs are freezing, hehe. I love the Charlotte Russe one: it looks like a much more comfortable height. i really love these fur lined boots ! i wish i have the right weather to wear these ! I'll have to go with the Sam Edelman!! I love his shoes and I bet they are much warmer than the Charlotte Russe option! I prefer the Edelman's better. They both look pretty chic but the height difference could be suited for different outfit purposes - tough choice! I like the pair on left, it looks more streamlined.